↑ List of Fellows of the Royal Society 1660 – 2007. UK: Library and Information Services, The Royal Society, 2007. The South Seas Project: maps and online editions of the Journals of James Cook's First Pacific Voyage. 1768-1771, Includes full text of journals kept by Cook, Joseph Banks and Sydney Parkinson, as well as the complete text of John Hawkesworth's 1773 Account of Cook's first voyage. The Endeavour Replica A replica of Captain Cook's vessel. See a c. 1780 map of Cook's third voyage by Rigobert Bonne, Carte de la Côte N.O. de l'Amérique et de la Côte N.E. de l'Asie reconnues en 1778 et 1779 / par M. Bonne, Ingenieur-Hydrographe de la Marine hosted by the Portal to Texas History. 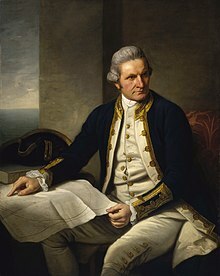 Cook's Pacific Encounters: Cook-Forster Collection online Images and descriptions of more than 300 artefacts collected during the three Pacific voyages of James Cook. Into the Blue: Voyages of Discovery 1700-1850 An opportunity to hear the tales behind some of the most adventurous (and, in some cases, disastrous) seafaring journeys. Images include illustrations and atlases from famous names such as Captain Cook, Baron von Humboldt and Commodore Anson.